Marc Rees is one of Wales’s leading exponents of contemporary performance and installation. His innovative interdisciplinary artworks are known for their flamboyant, humorous and often extreme interpretations of history, culture and personal experience. In addition to working with some of Britain’s foremost physical theatre companies (Brith Gof, Earthfall and DV8) and Germany’s premiere choreographers (Angela Guerreiro, Thomas Lehmen and Tanz Compagnie Rubato) his own extensive body of work includes the solo stage works Iddo Ef/Caligula Disco/Gloria Days, the installation/performances The House Project /RevolUn/Shed*light and the BBC film A Very Gladys night. He has lived and worked in Amsterdam, Montreal and Berlin and has initiated under his company R.I.P.E (Rees International Projects Enterprise) several highly successful artistic alliances with furniture designers, film makers, authors, composers and choreographers across Europe and North America. ‘ Adain Avion’:Artist taking the lead project, Cutural Olympiad 2012; ‘For Montain, Sand & Sea’, National Theater Wales , Barmouth 2010; ‘En Residencia’, Teatro de la Laboral, Gijon, Spain, March 2009; 'Cambrian Glass Collection and Cabinet', National History Museum, St Fagans, Cardiff, September 2007; 'Comfort Zone', Recontres Internationales, Paris, December 2006; 'Sx3 duet', SINOPALE, Sinop, Turkey, August 2006; 'Vaseline Machine', VERBO, Galeria Vermehlo, Sao Paulo, May 2006; 'Adagietto Ara Deg', 51st Venice Biennale, 2005 and Shed*light: 'Norman Behaviour', ARCO 05, Madrid, February 2005. An intimate, imaginary portrait of an extraordinary character. 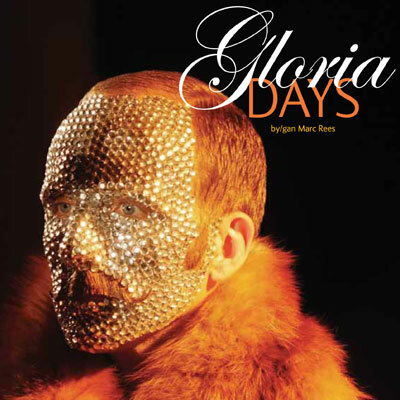 Gloria Days saw Rees return triumphantly to the stage with a theatrical work that was his most flamboyant and ambitious project to date. With the support of a world-class creative team that included opera designer John Macfarlane and Berlin dance duo Rubato, Rees created an imaginative, compelling and moving piece of dance theatre inspired by an extraordinary character– the 5th Marquis of Anglesey, Henry Cyril Paget. Known as ‘The Dancing Marquis’, Paget challenged and subverted Edwardian notions of class, gender, decorum and theatrical propriety. His fantastical lifestyle and subsequent unglamorous downfall provided the focus for this unique multi-disciplinary solo work.